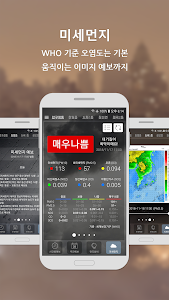 Wonju weather, a winner of the Meteorological Agency's Mobile App Competition competition, provides weather information on the basis of the data provided by the Korea Meteorological Administration. You can save up to five of your favorite locations through the weather to see the current weather, three hourly forecasts, weekly forecasts and fine dust pollution. In addition, you can easily observe domestic weather changes using national weather, satellite images, radar images and weather forecasts. Other features include convenience features such as snow / rain, fine dust, weather alarms, automatic alarms, status bar, current weather, and various widgets. Based on data from Air Korea (Ministry of Environment, Korea Environment Corporation), it provides fine dust pollution and forecast of each region, and you can choose between WHO and domestic standard. Automatically notifies you when you do not have an app running, unexpected snow or rain, bad air quality or new weather conditions. Some simple settings can be notified at any time. You do not need to run the app anymore when you're curious about the weather. With this feature, you can see the current weather conditions with a single drag. 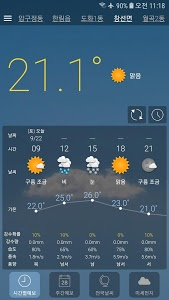 You can observe weather changes in Korea at a glance through satellite photos, radar images, weather information on the Korean Peninsula / Asia / Earth. 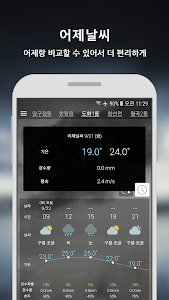 The weather offers 11 different widgets in different sizes. You can select widgets that match your preference by combining current weather, fine dust, hourly forecast, weekly forecast, and current time. In addition, you can specify 14 types of widget skins, transparency, and action when you touch them. A variety of backdrops follow my hand as the weather changes. 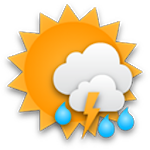 In addition, there are various weather icons that you can choose according to your preference and you can use your own icons through the 'Custom Icons' function. Storage space - Load custom icons and use to backup / restore your favorite areas. Location - to add your favorite locations, use your current location search. If you have any errors or suggestions, please feel free to contact us via email or blog! Similar to "원기날씨 - 미세먼지, 기상청 날씨"